"Such financial difficulties as may occur will almost certainly arise from political rather than economic sources." Earlier this year, in a flea market, I found an interesting book: Exchange, Prices and Production in Hyper-Inflation: Germany, 1920 – 1923, by Frank D. Graham (Princeton University Press, 1930). I had come across Professor Graham's name on Mises.org, so I suspected the book might offer insights into these matters from a free-market perspective. The copy I bought had languished in a well-known university's library for about 80 years and then been discarded — since some universities apparently are no longer in the business of preserving knowledge. Frank Graham (d. 1944) was a Princeton economist. He lived in, as the old Chinese curse has it, "interesting times." Generally, he supported free markets and free societies during a time when they were under unrelenting attack by jack-booted, collectivist intellectuals of various stripes. The book is very carefully written, and it marshals some impressive statistical analyses while defending market principles. Graham even refers to a paper published in 1925 by a then-increasingly – well-known teacher and philosopher, Ludwig von Mises. What follows is a layman's summary of some of the main points Graham raises. The historical setting for Graham's study tale begins with the end of the First World War. The armistice was engendered by the complete exhaustion of the warring parties. Then came the peace treaty with its assignment of "guilt" for the war to the Central Powers, and the imposition of heavy reparations. The Allies seized nearly the entire German merchant marine and nearly all the railroad rolling stock. Gold-mark reparations were also imposed. Against this background, the Weimar policy of intentional currency debasement made a certain perverted sense. Until the very end, willing foreign buyers could always be found for paper marks, so the Republic could still obtain the hard currency needed to meet Allied reparation demands. At the same time, the inflation created a capital goods boom that rapidly replaced the seized ships and rolling stock. Businesses had to choose between immediately reinvesting (and of course, malinvesting) profits in capital goods, or watching their funds evaporate overnight (literally, by late 1923). Starting with a gold mark worth about a dollar in 1920, Germans ended up with a worthless paper mark that, in November 1923 was replaced by a new gold-backed mark, at the rate of 1,000,000,000,000 (one trillion) old paper marks to one new gold mark. As a comparison, the worst inflation experienced in the United States (so far) was the collapse of the Continental Dollar. From 1776 through 1787, Congress's paper dollar fell from an exchange rate of one for each silver dollar to one thousand for each silver dollar. The Weimar hyperinflation was a million times worse, and occurred in a much shorter time span. The statistics presented show that the peak of the inflation was from early 1922 through November 1923, a little over a year. The last three months appear to have been the most intense. The experience from which he distills this understanding was grounded in the events of that time. The Weimar Central Bankers actually contended that their extraordinary printing of marks did not cause the extraordinary increase in prices. Indeed, prices actually tended, until the last couple months of the inflation, to surge a bit ahead of the printing presses in anticipation. Toward the end of the insanity, prices couldn't keep up because no one could rationally anticipate in such circumstances. This program produced both winners and losers. Landlords lost, since rents were fixed. Mortgage holders lost, seeing their holdings diminish to one trillionth of their original gold value. The Allies never collected more than a fraction of the reparations they demanded, which did benefit the Germans to some extent. Capitalists thought they were winners as they malinvested (but by 1930, Graham reports, the German economic buzzword was "rationalization" which in practice meant the destruction of the excess capital accumulation of the inflation years). Workers, in the beginning, thought they too were receiving benefits. The German economy as a whole was not greatly harmed by the short, intense inflation, but as it reached its peak, the signs of collapse were everywhere. Unemployment was very low in the early stages, but in the last three months it began to skyrocket, reaching nearly half of the working class. It appeared to Graham that the Central Bankers had stopped the inflation just in time. But, of course, Graham did not anticipate what came next. 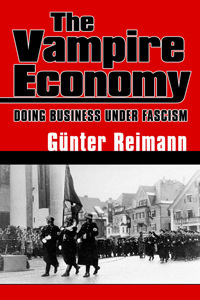 The economic controls imposed during the inflation — price controls, export controls, mandated producer and seller cartels — all became the basis of Nazi fascist economic policy, mobilizing the German economy for the production of arms and the destruction of Europe. "But, of course, Graham did not anticipate what came next…"
Professor Graham, while generally free-market oriented, later did get involved with the initial federal "stimulus" interventions under Hoover, which led to the bigger stimulus interventions under Roosevelt — which led to the Great Depression (not unlike the much larger Bush/Obama stimulus interventions we are seeing today). Certainly, there are lessons here for serious students of history. The consequences of pumping out many trillions of marks (or even just the few trillions of dollars now being created by the Federal Reserve) are simply catastrophic. And such policies lead, as Professors Mises and Rothbard taught us, to collapse, war, destruction, starvation, and death. Mises.org has Ludwig von Mises's 1932 review of Graham's book. See "The Great German Inflation." Economica. XII(36):227-234. May 1932.